The property for the first All Saints’ Church was granted to the church around 1868 from John Gartley, after which the first church was constructed. However; by the turn of the century the population of Magaguadavic had grown so much that a larger church had to be built to accommodate the 60 to 70 local people who attended services here. This site was chosen for a church because at the time this location was where the hub of activity took place in Magaguadavic and it sat at their central point of the community. 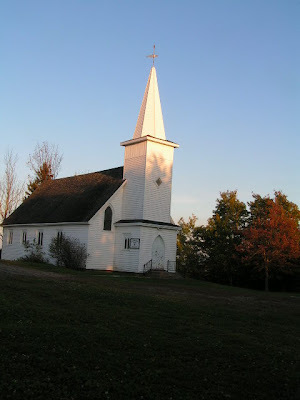 There was a general store at the bottom of the hill and the road that leads to the church continued down the hill and the road that leads to the church continued down the other side and was the main connecting link to residents who lived there. The church which sits on this site today was built in 1921 and it remains virtually unchanged from when it was built, with the exception of the steeple and bell tower which had to be replaced in 1992 because the old steeple was blown off during a rain and wind storm that went through the area. Although the seating capacity of All Saints’ is only 120, with the use of extra seats, as many as 175 people have been accommodated. An interesting fact is that the hall owned by All Saints’ Church was the former school of Magaguadavic.